Below is a diagram of how registration for APBC KYOTO 2011 will proceed. The Japan Biochar Association (JBA) and Japan Association for Human and Environmental Symbiosis (JAHES) are pleased to host the 2nd Asia Pacific Biochar Conference, APBC KYOTO 2011, in Kyoto, Japan on September 15 – 18, 2011. Abstracts for oral and poster presentations will be accepted that correspond to one or more of the following three research themes. 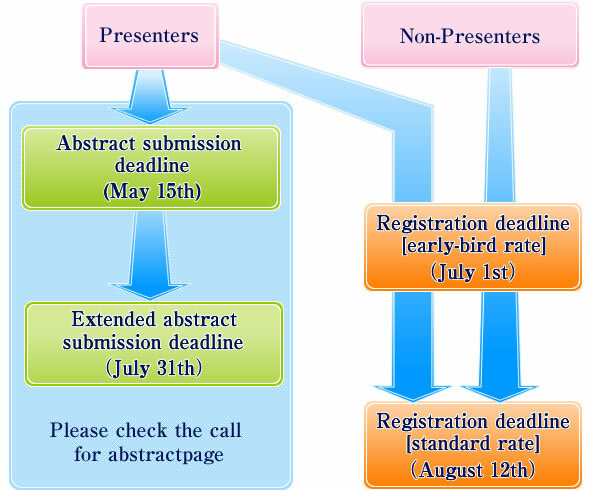 The entire schedule for abstract submission and registration is shown below. Submitters should use the abstract submission system. By clicking the button below, you will connect to the abstract submission system. If you would like to register for APBC KYOTO 2011, please click the button below. By clicking this button you will connect to the registration system.